Fully back into “camping” mode, we made it to Glacier National Park. The drive from Seattle was over 12 hours (while towing the trailer), all worth it to see the natural beauty that is Glacier National Park. The Waterton-Glacier Park is an International Peace Park between the United States and Canada, designated in 1932. Here, like most parks, is all about letting nature be natural. For the first time on our trip, Steve and I made daily visits to the Ranger’s quarters to check on the status of hiking trails. Every day there would be one or two trails closed due to Bear activity. This was a foreign concept for us, but appreciated that the Rangers wanted everyone to be safe, including the bears. Another first for us, was buying Bear Spray. The Rangers recommended it once we entered the park, plus signage everywhere indicated you should have some. The park has both Black Bears & Grizzlies, along with hundreds of other species. The moment we drove in to the park, onto the famous “Going-into-the-Sun Road” we were in complete wonderment, the peaks, the glaciers, and even the road itself is an engineering marvel. I must say, before reviewing Glacier National Park, we only saw a glimpse of the park, mostly from the West side. A fair evaluation would be from someone who did more in the East as well as enter the Canada side of the park. You could easily spend a week here and not see everything. We stayed at the mack daddy of KOAs. Rated as one of the top five KOAs in the country – it was pure luxury – as far as KOAs go. This KOA was clean, spacious and full of kind employees. The amenities included: family swimming pool, adult swimming pool/area, a dog run, ice cream shop, store, dinning hall, basketball court, laundry and many activities. There was a board as you entered that listed the daily activities. While we were there they hosted a nature slide show, which we did not attend. Our spot was beautiful and felt like we were in Montana. We had big mountains to our left and wide-open skies. Of course, the price of the KOA was triple the price as our Mount Shasta KOA. 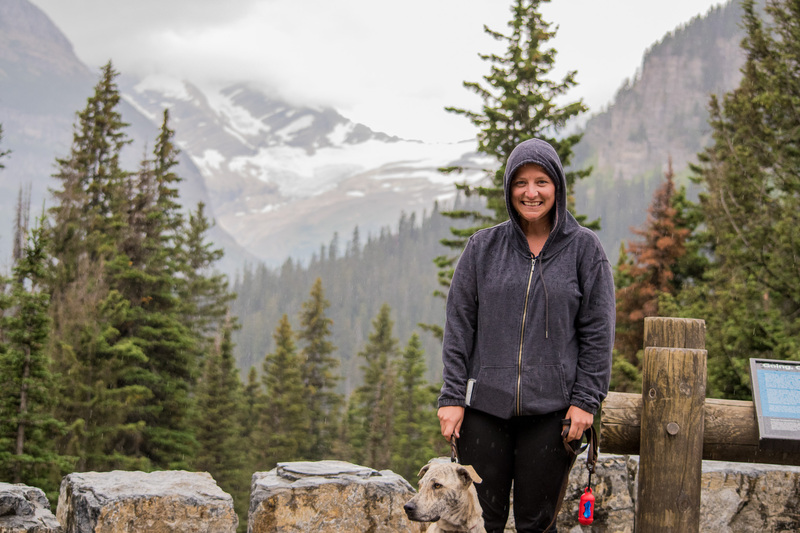 What makes this KOA very convenient, and our biggest selling point, is it is 6 minutes away from the West Glacier entrance, and 20 minutes from Columbia Mountain Kennels – where Sparky enjoyed his doggie day care on a ranch. I can’t tell you how much I loved his doggie day care. The owners, Will & Andrea, took great care of Sparky and had pride in their work. They recommended us hikes and the best local Huckleberry milkshake. At $15/day, we highly recommend this place to all those traveling with dogs. Also, they were hockey people and were one of the few who understood Steve’s personalized license plate on his truck “4TH LNR”. 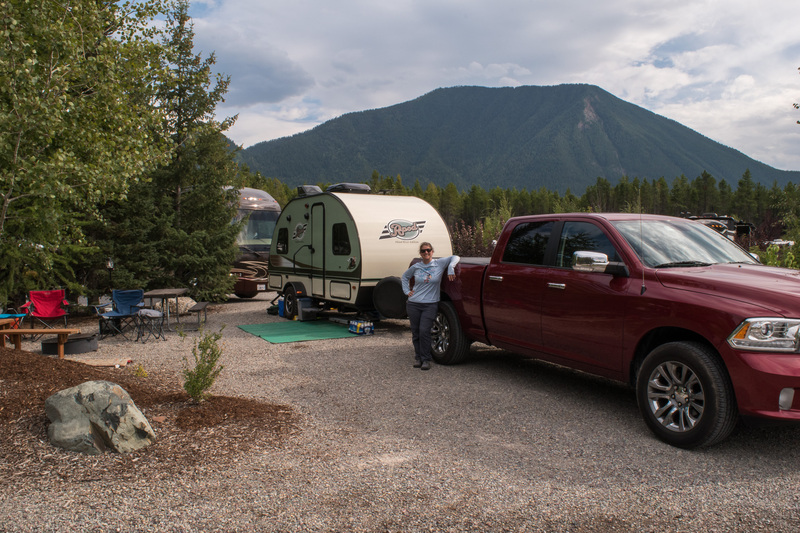 We arrived at the KOA just after lunchtime on Thursday, and after a quick setup we were on the road to Glacier National Park. We decided to do the “Going-to-the-Sun Road”. It is a 50-mile road that connects West Glacier to East Glacier, and has several points of interest along the way. This road is more than beautiful, but for those weary drivers it has parts driving in a narrow, steep mountainous terrain – needless to say, Steve drove. Our truck made the size restrictions – less than 21 feet long, and 10 feet wide, if you make a visit, be aware of those restrictions. If you don’t feel up to driving it, they have tours, as well as shuttles that take you along the road. The shuttles come in handy, as many of the parking lots along the road fill up by 9AM for hikers. Some of our favorite highlights from the scenic drive include: McDonald Creek, the West Tunnel (workers in 1926 had to dig a tunnel through 192 feet of Mountain – can you imagine!? ), Heavens Peak, Bird Woman Falls, the Triple Arches, the East Tunnel (408 foot! ), and spectacular views of Jackson Glacier. The day we did our drive was a cloudy and raining, and even so, it was stunning. We also witnessed the damaging effects of the great fire of 2003 – caused by a lighting storm, and burning 13% of the park. Friday it was time to get our hiking shoes back on. After we dropped Sparky off at daycare we headed into Glacier and was lucky to find parking at The Loop parking lot. We decided to take the shuttle from there to Logan Pass visitor center up the mountain to begin a few hikes. The shuttle arrives every 15-30 minutes, but the first one that came by was fully loaded. 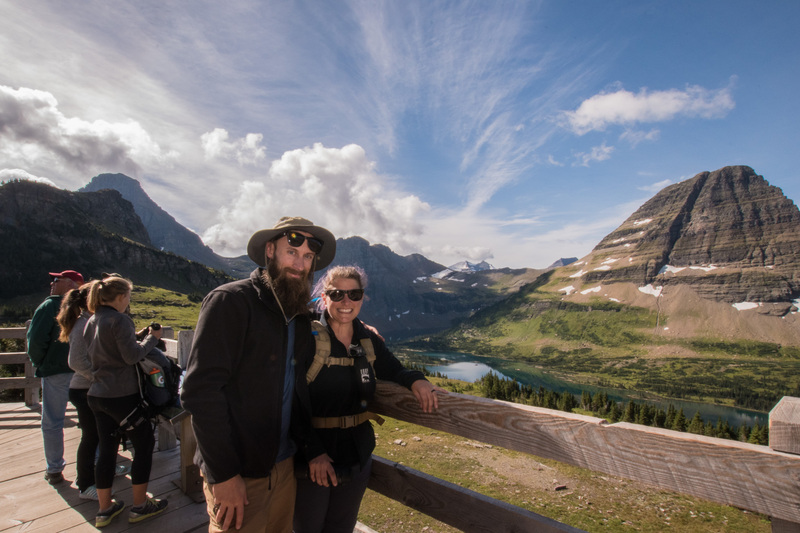 We were at Glacier during the National Park Service’s free weekend to celebrate their 100th birthday; we were not shocked at how crowded it was. They sent a special empty shuttle to grab our group to take us shortly after. Once we got to Logan Pass Visitor Center we headed in to the Ranger’s office and was delighted to see the Highline Trail was open. The Highline trail is a popular trail and it had been closed for over a week due to a carcass being about 40 feet from the trail, and was a feeding ground for Grizzly Bears. One of our shuttle drivers during our trip had a theory that Highline was closed due to trail maintenance in order to prepare for a VIP visit from the Secretary of Interior for the birthday celebration. 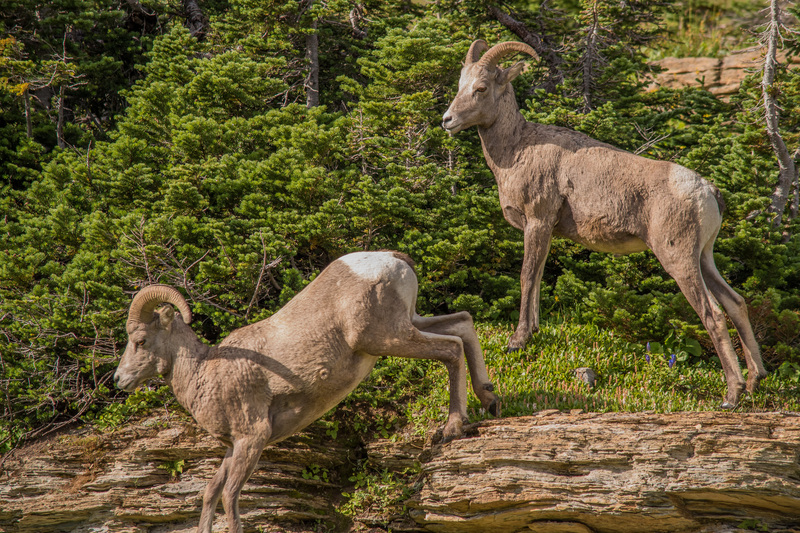 She indicated she didn’t believe a Mountain Goat would fall of the cliff and die and asked what we thought, to which we replied we had no idea what Mountain Goats would do – #NPSconspiracy. Our first hike was to the Hidden Lake Overlook, the full trail to the lake shore was closed due to bear activity. The trail was mostly on boardwalk and was popular. Out and back the trail is just under 3 miles and had a climb of 460 feet. Within the first 100 yards we were treated to a spectacular sight. A herd of Bighorn Sheep crossed over the boardwalk and into the field to our right. We even saw a few of the Rams clashing horns. Further along the hike we saw Hoary Marmots, they were so cute! 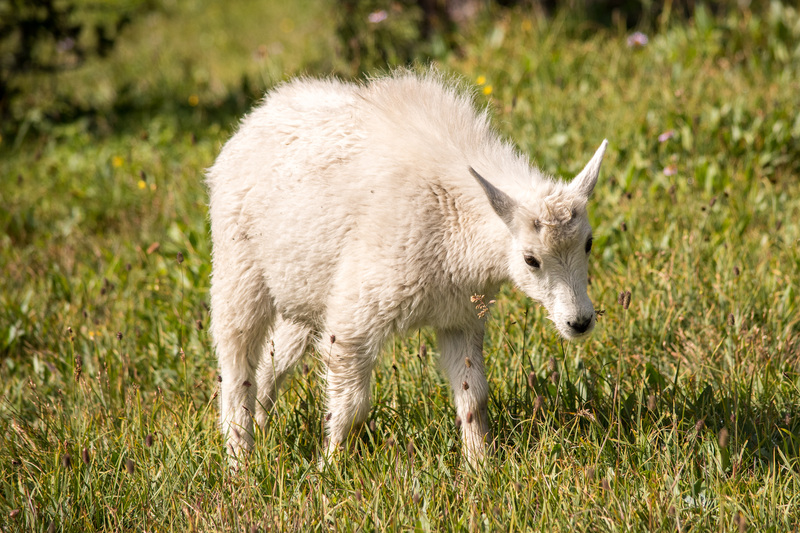 Just when we thought nothing could get better, we saw Mountain Goats! They got within 20 feet of us! We reached the overlook and the lake was beautiful. It amazes me that a lake can have so many different shades of blue – it looked tropical. 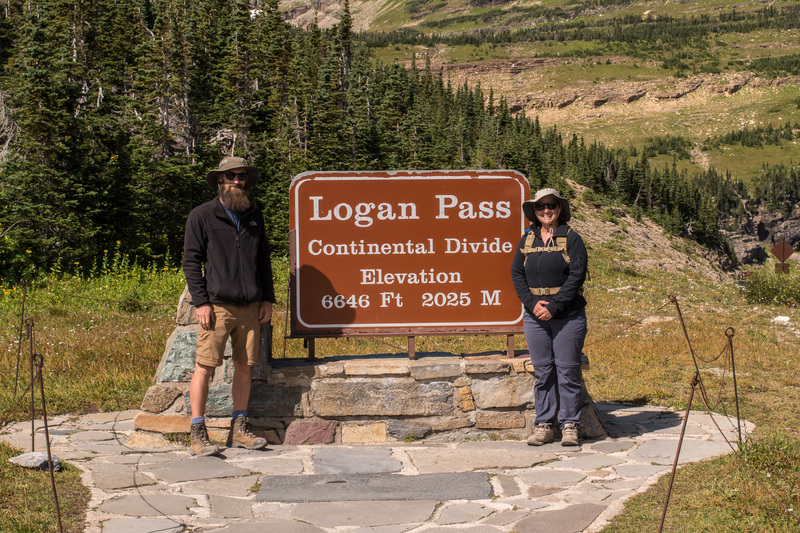 We made sure to stop at the picture opportunity – Logan Pass Continental Divide. At this point, water is either going to the Pacific Ocean via the Columbia River, or the Gulf of Mexico via the Mississippi River. 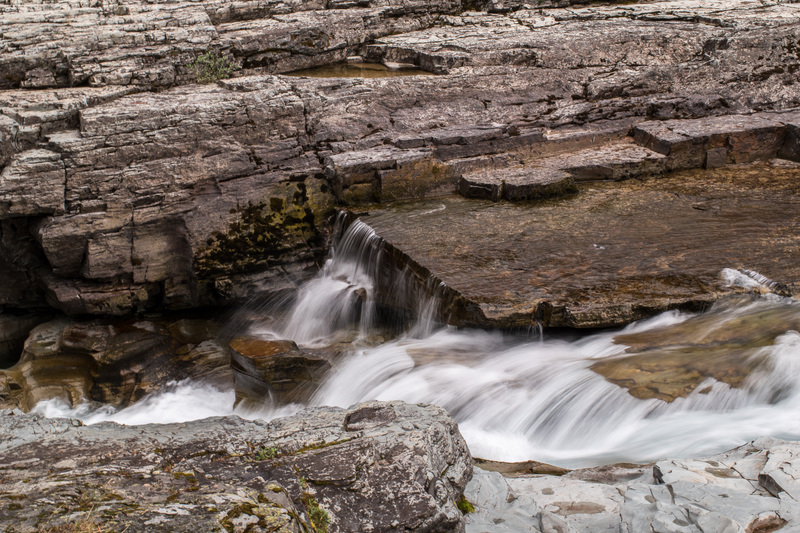 Nearby is the Triple Divide Peak, where a matter of inches can determine if rain water travels to the Pacific, the Gulf or the Hudson Bay via the Saskatchewan River in Canada. Our second hike was the famous Highline Trail. The trail connects to The Loop Trail, making it a 11.8 hike, with a 800 foot climb and 2,220 foot descend. The trail hugs along the ridge line with cliffs immediately below you. They installed a rope on the mountain so hikers could grab on if needed. The trail is narrow, making it challenging at times to manage hikers traveling from the opposite direction. The terrain made this hike a bit challenging, and the amount of people and traffic also slowed our pace. The views were breathtaking, and our hope is our pictures can do it justice. The wild flowers growing alongside the mountain were bright and vibrant. We made sure to pick some Huckleberries along the hike for a sweet break. Most of the Huckleberries were picked off, from either hikers or wildlife. 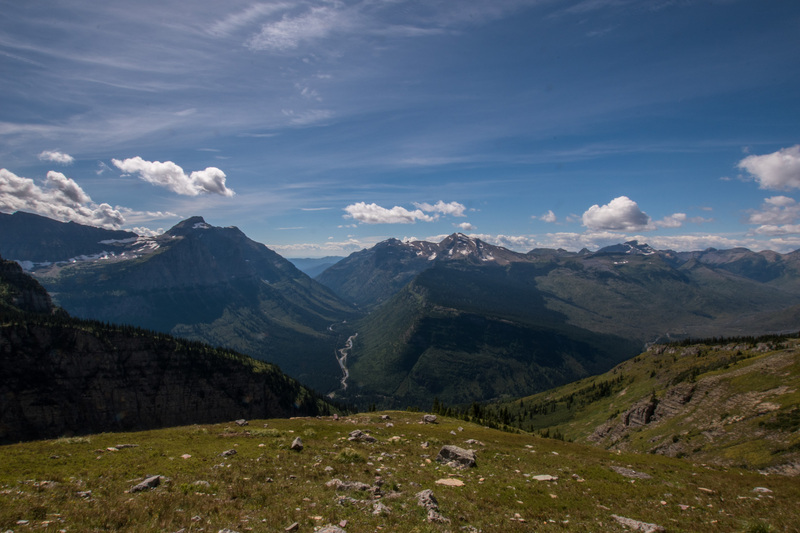 At about 7 miles in, there is a cut off to the Grinnell Glacier overlook. The cut off was practically vertical, and after climbing for 5 minutes we realized this would be a 40-minute detour and we were running out of time. We turned around and finished our hike to the Chalet restroom stop – at 7.6 miles. It was at this time we recognized how pressed for time we were, and proceeded to do the remaining 4.2 miles, with a 2,200 feet descend, in 75 minutes. We were practically jogging down the trail. The Loop trail goes through fire damage forests and had unique, recovering vegetation. Alas, we made it to our parked car with a few minutes to spare! We removed our stinky hiking shoes and experienced true bliss when putting on clean socks and our sneakers. We hit the road to pick up Sparky from his daycare and made it just before closing time. At the advice of Will from Columbia Mountain Kennels, we headed to The Huckleberry Patch in the town of Hungry Horse to pick up their famous Huckleberry milkshake and a slice of pie. The milkshake was heavenly and were a nice treat to a 15+ mile (44,000 steps) day. Saturday, we woke up a bit sore, no problem – Advil to the rescue! We also did a very adult thing, ate Huckleberry Pie for breakfast. My 10-year-old self would be so proud. We dropped Sparky off for a second day of dog play and we were off back to Glacier. We opted for an easier hike, the trail to Avalanche Lake. This trail was less than 5 miles with a 500 foot gain. The trail went through an area of Cedar trees and indulged us in an impressive look of a Avalanche Gorge coming from the Avalanche creek. The lake itself was picturesque, with three different waterfalls coming into the lake. We gave our feet a break and took in the views. Our hike back to the shuttle was more exiting. We saw a family of three deer enjoying sap from trees. We watched and took pictures for about five minutes before the deer crossed the trail and took off. We thought pretty highly of ourselves that we got such great pictures and thought that was that. Sure enough further down the trail the same family of three deer were enjoying more sap. Steve was taking fantastic pictures. Suddenly all three deer stood still, like they are posing for the cameras. 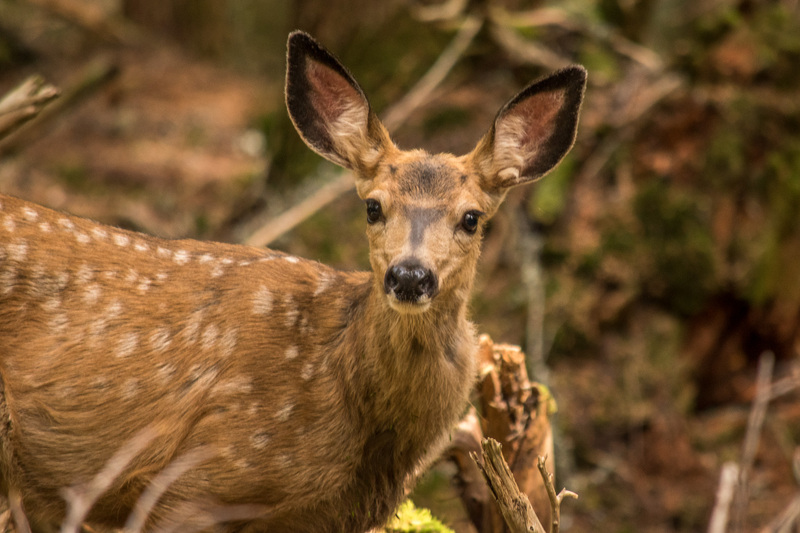 As people were busy clicking away, I gazed where the deer were looking…. “BEAR!!! 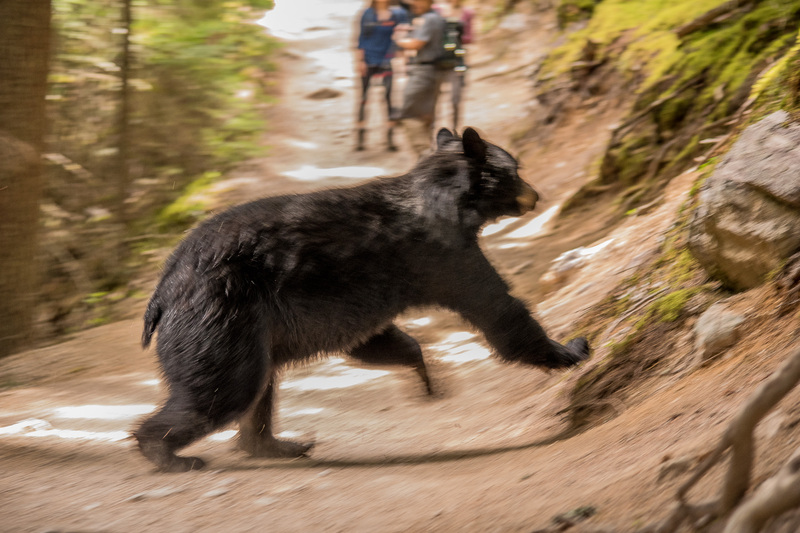 !” Everyone stopped and looked where I pointing and now it’s a race to get a great bear picture. It was an adorable Black Bear, probably not fully grown, and completely not interested in humans or the deer. Looked as if he was just on a stroll. He gave us a surprise by crossing the trail allowing a rare photo opportunity. The Avalanche Trail is one of the most popular trails, with thousands of people on it daily, no one would’ve thought we would see a bear! The hike seemed to float by after; we were both on a bear high! On this trip, we got lucky with animals. Sadly, we didn’t see Wolverines, Grizzlies or Elk. Once the hike was over, we waited for our shuttle and headed back to the visitor center where our car was. We decided to call it a day; we were still sore from the previous day and had a lot of errands to do at “home”. It is interesting that even though we are on vacation, this is very much our lives, which include cleaning our truck & trailer, doing laundry, meal planning for the next few days, grocery lists, walking and playing with Sparky, staying in touch with family, and taking care of the blog (it is a lot more time consuming than you would think). Even though we are always on the go, we have made a routine. I was happy to Facetime with my nephew & niece, Xander and Giulia. Both are starting school this week, and even though I am happy where we are, there is a piece of me that aches to give them hugs and kisses. I think this was my first time feeling a bit of homesickness for my family & friends. This morning we said goodbye to our home at Glacier and hit the road by 8AM. 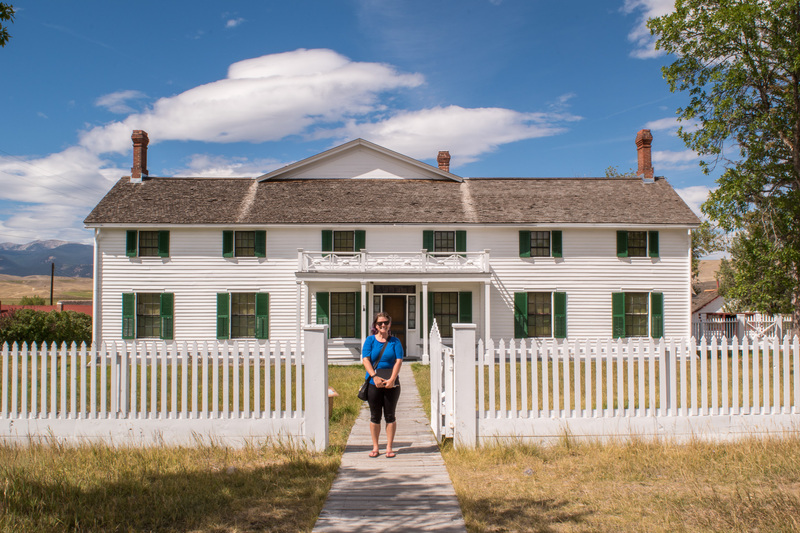 We made a stop in Deer Lodge, Montana to visit the Grant-Kohrs Ranch, a National Historic Site. It was interesting. The concept of open ranches is foreign to me – the cows would go everywhere! Thus, the American Cowboy was born, to round them up for the Cattlemen. The family of Kohrs was a great American story. Conrad & Augusta Kohrs immigrated from Hamburg, Germany – with the dream of making it in the gold rush. When that didn’t pan out, he worked as an assistant butcher, eventually making enough money to buy the ranch from Johnny Grant and made it big in the cattle business. He even helped form the Montana Stockgrowers Association. Steve and I roamed through the ranch, and said hello to the cows, “Moo”. It was a great break from being in the car. Once we got back into the road, near Bozeman, we saw great smoke coming from the side of the freeway. 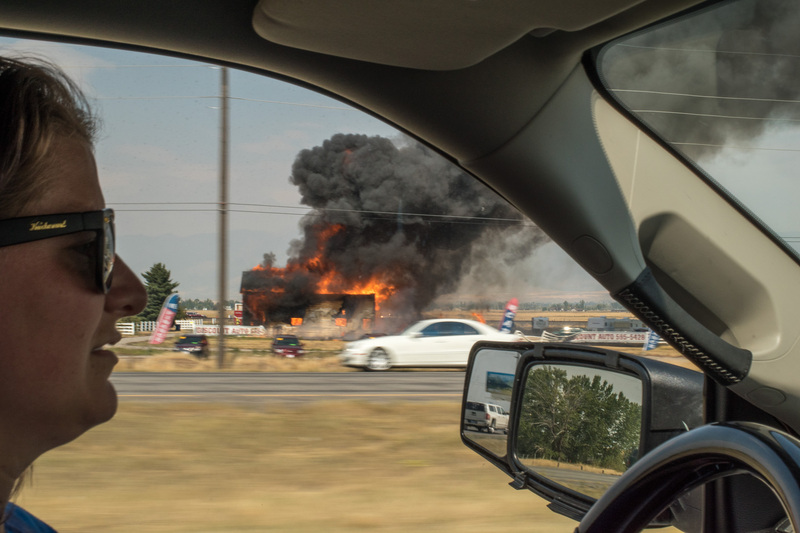 Once we got closer we saw an auto shop on fire. Steve was able to capture a picture before the fire department got on scene. Just another exciting day on the road! Glacier is a place we would love to go back to! Like I had mentioned earlier, we barely covered the park. When we go back, we would like to visit more of the Eastern side of the park, like Two Medicine and Many Glacier, as well as the Canada Waterton area. We didn’t do the famous car tour, which we will consider, so we can both catch the views from the drive without worrying about the drive. We also will look into the boat tours. Several hikers told us that the boat tours are amazing. We are heading to Yellowstone! On our way down from Glacier we noticed the thick haze surround Yellowstone due to fires. We are hoping the fires are under control and we can get some sightseeing in. Hoping to see some Bison, Elk & Grizzlies! Beautiful pictures and blog. Love you! Can’t wait to see your Yellowstone photos! That place is amazing. I wish I had been able to spend more time there. So far we really love it! Your pics are great and do capture the vast open space–it’s so great to realize places like this exist in our country. It’s easy to forget when you live in a populated area like the Bay. This place looks beautiful!!! You guys are giving me ideas for future trips. I think Tom and the kids are in trouble. 🙂 The kids loved talking to you too (as did I). Can’t wait to hear how Yellowstone went. (Again, plotting trips over here). Love you!! NIce to meet you both at Logan’s Pass. 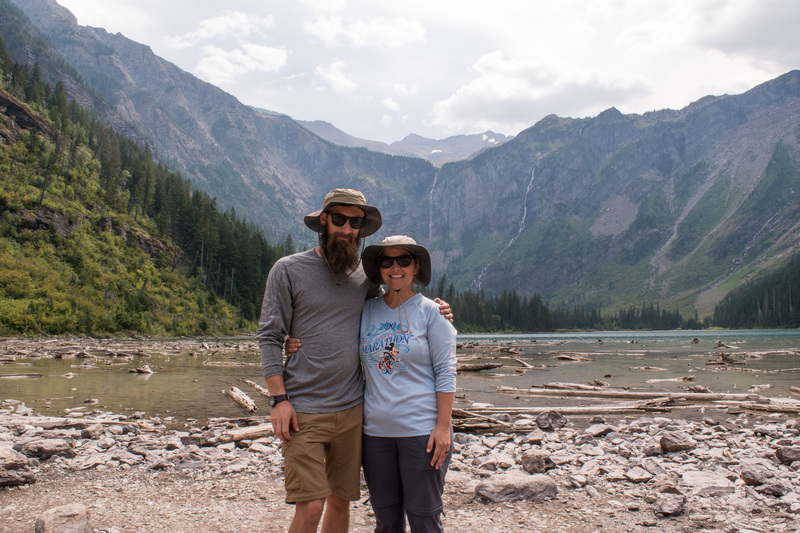 Glad you got such a treat with the bighorn sheep on your Hidden Lake Hike. We were glad to be able to get on Highline at the end of the week as well. Didn’t get the bear shot you did at Avalanche though. Amazing! Safe travels! It was nice to meet you as well. Glad you were able to get the Highline in, it was amazing. Thanks for the well wishes and for checking out the blog!